So, you’ve decided to opt for cloth diapers. That’s great. You’ll already be enjoying the countless benefits that a cloth diaper provides. What’s more, you’re saving the environment and protecting your baby’s well-being. But you’ll also be aware of the downsides of using a cloth diaper. Mainly, they can sometimes be tough to clean. But don’t worry. There is a range of diaper sprayers designed to clean your diapers to the highest standard. This saves you countless hours throughout your day. Get ready for clean diapers, happy babies, and a happy mom and dad. To help you make an easy decision, I’ve compiled a list of some of my favorite cloth diaper sprayers. Each one is specially designed to make your life effortless. To start off my list, I’ve chosen this outstanding diaper sprayer that excels in every task you put it too. The biggest issue I faced when cleaning my cloth diapers is having to swish the diaper around the toilet. This is to loosen up the stubborn ‘bits.’ However, the SmarterFresh Sprayer has an adjustable power and pressure setting. This setting has made this task a thing of the past. Also with this purchase, you’ll find everything you need to get you started. This includes a toilet T-valve adapter, the hook holder, and the essential sprayer hose. This means that the installation of this device is problem and hassle-free. What's Great About It: The fact that this sprayer can tackle so many different tasks makes it a winner. In addition to cleaning diapers, you can wash your shower with it or clean your child’s potty as they grow. You could even clean your bidet with it. This excellent little device has saved me a ton of time in the past when it comes to cleaning diapers. It’s affordable, made from durable materials and, as the title suggests, it gets the job done. The best bit about this sprayer is the power that you’ll get to wield. This high-pressure water blaster is perfect for removing pesky stains and ‘leftovers’ that won’t budge. I’m sure you’ll agree that's a common problem we’ve all had to deal with from time to time. The device is easy to set up, especially when attaching your hose as it uses the most common 7/8 fixture connection. What's Great About It: The most significant aspect of this device is simply how easy it is to setup and use. The hose can be effortlessly connected to your toilet in around 15 minutes. It’s also incredibly simple to change the pressure to your desired setting. This gives you the most efficient spraying experience possible. To conclude my list of favorites, BabyMojo has provided us parents with a show-stopper. This super-affordable sprayer gives you two settings. You can use a high-pressure power wash or a slow shower of water. This is ideal for tackling whatever kinds of substances stand between you and a clean cloth diaper. As you can see, this kit comes complete with everything you need. 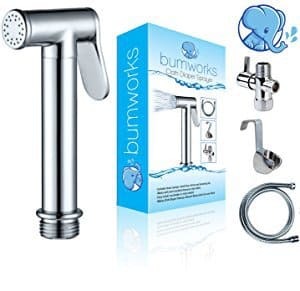 There’s an included 5 foot hose with all the attachments you’ll need to connect the device to your toilet. You could even connect it to a tap in your wall. There are also custom hangers to ensure that your device is safely stowed away while it’s not in use. What’s more, BabyMojos will even supply you with your own wet/dry bag with your sprayer kit. This means you can store your baby’s diapers for cleaning at a later date.​ This is perfect for if your little bundle of joy is being watched by a friend or family member. There’s also an included three-step instruction manual that details how to make your own cloth diaper sprayer splatter shield. Any parent that has begun cleaning their cloth diapers will know of the struggles and messes that come with cleaning them. However, times are changing. This innovative shield can be made for less than $5, saving you a lot of time, money and mess. What's Great About It: In addition to all these supportive features, you’ll also get to enjoy a one-year warranty, which means that if you experience any damage or a faulty connection, you can replace or refund your device at no cost. 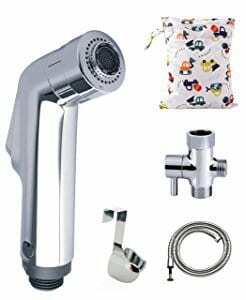 Shopping around for a good cloth diaper sprayer may seem like an overwhelming task. As first-time buyers, you may not know what you’re looking for. However, I’m here to help by telling you everything that you need to know. Let’s be honest, cleaning our child’s diaper is not the most enjoyable task we’ve ever set about doing. You’ll be more than familiar with stubborn stains and tough to clean ‘debris.’ This is why you need a powerful sprayer device. However, a sprayer can’t just be pure power. What happens when you find some looser bits? In reality, it’s going to go everywhere. With this in mind, I recommend choosing a sprayer with adjustable settings. You may opt for a cheaper sprayer in line with your budget. However, this is not always the best route to take. Maybe you’ve installed your sprayer and it doesn’t feel secure or stable in your hand, or it feels incredibly light. The chances are that it’s made to a very poor standard. Once you’ve pumped water through your sprayer a couple of times, it’s likely to start leaking. You’ll also be left with a broken product. 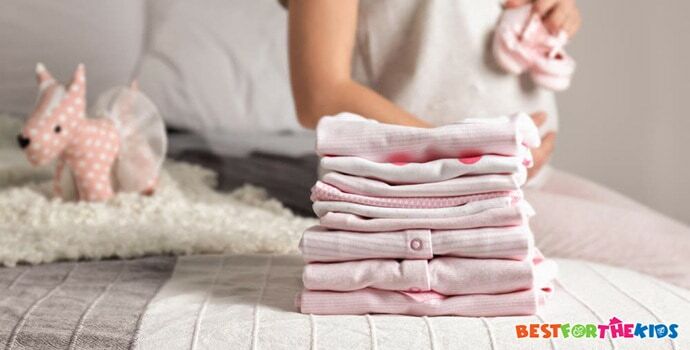 When cleaning diapers, it’s safe to say that you’re going to have your hands full. This is why it’s so important that you choose a sprayer that’s as easy to use as possible. That means that you’re not fiddling around with settings or trying to work the sprayer while you’re overwhelmed with diapers. Typically, most sprayers will simply attach themselves to the side of your toilet. When it comes to installing, you want this to be quick and effortless. The materials used in your sprayer will be an excellent indication as to the quality of your device. Nowadays, you’ll want to be looking for a sprayer that’s designed using high-quality ABS plastics that will last. These plastics materials won’t scratch easily and they are extremely versatile. This means it won’t matter if you drop them if you’re overloaded with diapers. Alternatively, a chrome-coated or metal sprayer is so much more dependable. With these, you’ll never have a problem with it breaking or seizing mid-use. In truth, a cloth diaper sprayer isn’t entirely necessary in day-to-day life. However, the amount of time, energy and effort you’ll save is incomparable. Thousands of parents around the world have rejoiced in this invention that has changed their lives. With parents spending less time cleaning diapers, they can spend more time with their children. This means you can live the intimate and lovely life that you deserve to have.